The horrible deaths of over 1,100 clothing workers in Bangladesh bear more than a passing resemblance to the infamous Triangle Shirtwaist Fire of l9ll in which l46 garment workers perished. In certain key respects nothing has changed over the last l00 years. In both New York l9ll and Bangladesh 2013 the distinguishing characteristics of garment manufacturing were low capital entry levels, cut-throat competition, utterly atrocious wages and working conditions, and bosses who ranked with coal mine owners when it came to respect for human life. Both then and now, these catastrophes were completely avoidable as well as being completely predictable. Yet another parallel is that there were unheeded warnings. 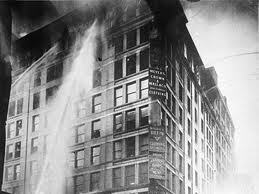 Fires in the shirtwaist sector of the New York City garment trade were nothing new; smaller building collapses had already occurred in South Asia’s 21st century version of 7th Avenue. The sheer magnitude of the catastrophe raises an alarming question: Can it be that things are actually worse for working people throughout the world than they were l00 years ago? Twenty-five years ago such a conclusion would have been implausible if not downright unthinkable. For people on the left, (though of course polls don’t get taken on things like this), the consensus seems to have been that world history had entered a period of transition from capitalism to socialism—however long and messy that transition might turn out to be. But who’s going to bet the price of a six-pack on that in 2013?